Hello friends! I have some exciting news… (before you jump to too many conclusions, no I am not pregnant, we are not moving, and life is pretty much staying the same). My news centers around the Travel and Adventure Expo being held in Santa Clara this weekend. First of all, I’m excited to walk around, check out the newest travel accessories, and see what the vendors have to offer. All of that will be really fun for me. However, the real excitement is happening Saturday morning at 11:30am. 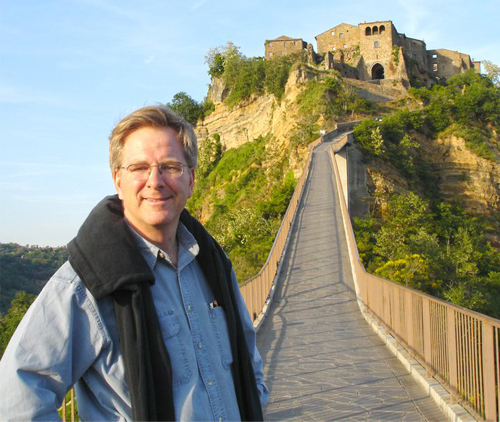 My travel hero, Rick Steves, will be giving a lecture on traveling in Europe on a budget! I’m so excited to see him in person. But wait, it gets better. Rick will be conducting a meet and greet after the lecture. A meet and greet! I will be able to shake hands with the man who has helped me fall in love with Europe! Ahhhh! To be honest, I’m so excited that I can hardly stand it. I get nervous and a little overwhelmed thinking of what I want to say to him. I’ve decided to bring a copy (or two) of my favorite DVDs for him to sign. Robbie thinks I’m dorky for wanting to do this, but I don’t care! It’s a once in a lifetime opportunity to meet a hero. I don’t have time to care if I look like a dork. Unfortunately, Robbie won’t be able to join me for the first lecture on Saturday, so my dear friend Sobrina has decided to come along. She seems to be super excited as well (although I think some of it is excitement around seeing my nervous red face when we first meet him). I’m thrilled that she’ll be joining me because Sob is such a good friend that I don’t have to worry about geeking out in front of her. She’ll just laugh alongside me and snap my picture. Oh geez, just thinking about taking a picture with Rick Steves is getting me excited again. Let’s face it: he’s my Justin Bieber. Who is your hero? Have you had the opportunity to meet them? Well, he wasn't a hero or anything like that but I did get to meet Huey Lewis at a meet and greet. Soooooo, he comes out into the room and nobody, I mean nobody is speaking! Lol, seriously! So, I looked at a group of about 12 of us and shouted "Power of Love"! Well, needless to say we all got a huge laugh, even Huey and he signed my t-shirt! It was a great concert:)!